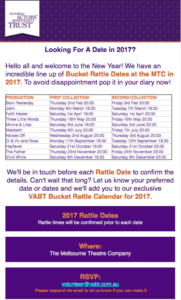 Get Your Rattle On In 2017! 2016 was a fabulous year with new Rattler volunteers, thousands of dollars raised and assistance provided to many, many of our community in need. 2017 is shaping up to be our best year yet so get on board as a volunteer and be a part of this incredible community. Head on over to our VOLUNTEER page and sign up today.